Hollywood's celebrities are a major tourist attraction in Los Angeles long after they're dead. Several cemeteries in LA are known for their famous residents, and visitors flock to pay homage to their idols at their final resting places. One of the most famous cemeteries in Los Angeles is Westwood Village Memorial Park, home to the graves of Marilyn Monroe, Truman Capote, Billy Wilder, Natalie Wood and Walter Matthau. Forest Lawn Glendale houses the graves of Walt Disney, Nat 'King' Cole, and Humphrey Bogart. Clark Gable and Carole Lombard are here as well in the Great Mausoleum, but it isn't open to the public. Forest Lawn Hollywood Hills has the graves of Lucille Ball, Liberace, Bette Davis and Buster Keaton; while Holy Cross Cemetery in Culver City is home to celebrities like Bing Crosby, Bela Lugosi, John Candy, Rita Hayworth and Ray Bolger. Hillside Memorial Park in Baldwin Hills is the final resting place for Al Jolson, Jack Benny and Michael Landon. The most famous celebrity cemetery, however, is Hollywood Forever, located on Santa Monica Boulevard in a scenic location under the HOLLYWOOD sign. Celebrity gravesites in Hollywood Forever include Rudolph Valentino, Cecil B DeMille, Mel Blanc and Douglas Fairbanks Jr. Tourists looking for celebrity graves should always be respectful of other cemetery visitors who may be grieving. 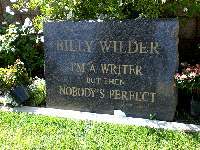 To find out where a specific celebrity is buried, visit www.findagrave.com.